Broccles has developed a taste for literature. It began with the newspapers I had been stealing from the neighbours’ recycling bins for lining guinea pig housing. He seemed to enjoy those very much, making no distinction between tabloid and broadsheet, or between different political affiliations. But now he is growing more choosy. He has started pulling books off shelves and working his way through those, placing particular focus on our personal favourites such as Gormenghast. It’s pretty frustrating when he does this sort of thing without so much as a by-your-leave. Moreover, when I try to tell him off, he skips around, flaunting his giant feet and aeroplane ears, and it is difficult to maintain an air of seriousness. So Bunty is trying a new stategy: feeding him the works of Ayn Rand. Bunty had bought Rand’s books out of philosophical curiosity, but her historically misinformed bigotry had put him off. We moved all the good books out of his reach and gave Broccles the Ayn Rand. 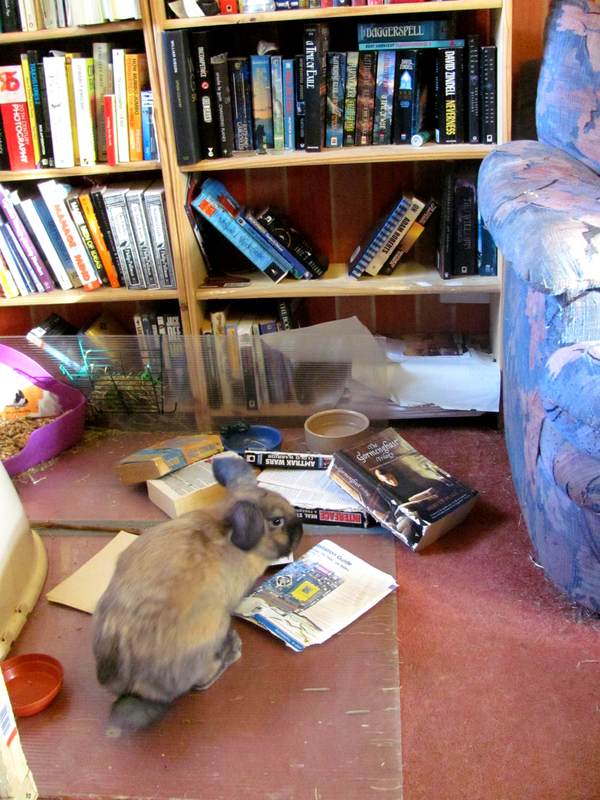 He has politely nibbled a corner or two, but so far it seems her books are too distasteful even for rabbits. Now that’s the Apple toy for a rabbit (or similar beastie) – the iGnaw. It’s a shame I don’t know what it is yet to patent/copyright it. Though it might turn out instead to be a shield substitute for a viking barbarian for working oneself up into a battle frenzy. Then again, most computer applications have that dys-functionality already. The Rand volumes must be truly vile to be rejected by this coprophile! You should tell the GOP!